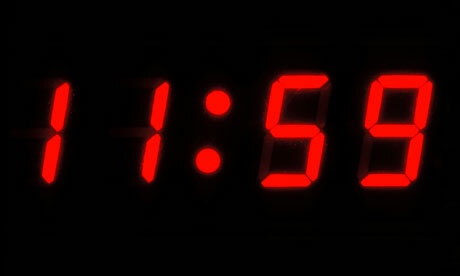 Wait a second: on Saturday night atomic clocks will read 23 hours, 59 minutes and 60 seconds. The world is about to get a well-earned long weekend but don’t make big plans because it will only last an extra second. A so-called “leap second” will be added to the world’s atomic clocks as they undergo a rare adjustment to keep them in step with the slowing rotation of the Earth. Super-accurate atomic clocks are the ultimate reference point by which the world sets its wristwatches. But their precise regularity – which is much more constant than the shifting movement of the Earth around the sun that marks out our days and nights – brings problems of its own. If no adjustments were made, the clocks would move further ahead and after many years the sun would set at midday. Leap seconds perform a similar function to the extra day in each leap year which keeps the calendar in sync with the seasons. The International Earth Rotation and Reference Systems Service (IERS) based in Paris, is responsible for keeping track of the gap between atomic and planetary time and issuing international edicts on the addition of leap seconds. Gambis said the turning of the Earth and its movement around the sun were far from constant. In recent years, a leap second has been added every few years, slightly more infrequent than in the 1970s, despite the long-term slowdown in the Earth’s rotation caused by tides, earthquakes and a host of other natural phenomena. A collection of the highly accurate devices are used to set Coordinated Universal Time, which governs time standards on the worldwide web, satellite navigation, banking computer networks and international air traffic systems. There have been calls to abandon leap seconds but a meeting of the International Telecommunications Union (ITU), the UN agency responsible for international communications standards, failed to reach a consensus in January. “They decided not to decide anything,” said Gambis, adding that another attempt would be made in 2015. Opponents of the leap second want a simpler system that avoids the costs and margin for error in making manual changes to thousands of computer networks. Supporters argue it needs to stay to preserve the precision of systems in areas such as navigation. Britain’s Royal Astronomical Society (RAS) says the leap second should be retained until there is a much broader debate on the change. Time standards are important in professional astronomy for pointing telescopes in the right direction but critical systems in other areas, not least defence, would also be affected by the change. “To argue that it would be pain-free is not quite true,” Massey said. Well I hate to admit that I was right but…. Suggestions from some of my Physics students reached fever pitch that the world they were in would fall apart it seems that the boffins got it wrong and Einstein’s relativity theory was wrong after all this time. In fact the team doing the research got it wrong twice and my students and half the world was sucked it. I firmly stuck to my idea that they must have a systematic error in their equipment. Such theories are not lightly changed and what concerned me mostly is that even if the particles did travel faster than light this was presented as a fact but where was the theory for why they would travel faster than light! This seemed to be a more important question as for everything else we know things that have mass can never travel that fast. Hence, cannot be true! Usually in Physics there is an obvious reason for everything. So it also appears that they two problems which would have had opposing effects on the apparent speed. On the one hand, the team said there is a problem in the “oscillator” that provides a ticking clock to the experiment in the intervals between the synchronisations of GPS equipment. That problem would increase the measured time of the neutrinos’ flight, in turn reducing the surprising faster-than-light effect. The team also said they found a problem in the optical fibre connection between the GPS signal and the experiment’s main clock – quite simply, a cable not quite fully plugged in. In contrast, the team said that effect would increase the neutrinos’ apparent speed. The team had carried out their measurements for more than three years, exhaustively scrutinising their methods and analysis before announcing the results last year – so why had they not found these issues before? “It’s sometimes very difficult to tell whether this thing could have been done before – because in a sense the answer is always yes,” said Sergio Bertolucci, director of research at Cern. This is a great article which shows the process of having a theory and then trying to prove it, even if the experiement is huge! Supersymmetry fails to predict the existence of mysterious super particles. Results from the Large Hadron Collider (LHC) have all but killed the simplest version of an enticing theory of sub-atomic physics. 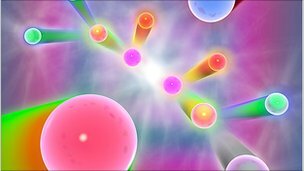 Researchers failed to find evidence of so-called “supersymmetric” particles, which many physicists had hoped would plug holes in the current theory. Theorists working in the field have told BBC News that they may have to come up with a completely new idea. Data were presented at the Lepton Photon science meeting in Mumbai. They come from the LHC Beauty (LHCb) experiment, one of the four main detectors situated around the collider ring at the European Organisation for Nuclear Research (Cern) on the Swiss-French border. According to Dr Tara Shears of Liverpool University, a spokesman for the LHCb experiment: “It does rather put supersymmetry on the spot”. The experiment looked at the decay of particles called “B-mesons” in hitherto unprecedented detail. If supersymmetric particles exist, B-mesons ought to decay far more often than if they do not exist. There also ought to be a greater difference in the way matter and antimatter versions of these particles decay. The results had been eagerly awaited following hints from earlier results, most notably from the Tevatron particle accelerator in the US, that the decay of B-mesons was influenced by supersymmetric particles. LHCb’s more detailed analysis however has failed to find this effect. This failure to find indirect evidence of supersymmetry, coupled with the fact that two of the collider’s other main experiments have not yet detected supersymmetic particles, means that the simplest version of the theory has in effect bitten the dust. Collisions inside the LHC should have found some evidence of Supersymmetry by now. The theory of supersymmetry in its simplest form is that as well as the subatomic particles we know about, there are “super-particles” that are similar, but have slightly different characteristics. The theory, which was developed 20 years ago, can help to explain why there is more material in the Universe than we can detect – so-called “dark matter”. According to Professor Jordan Nash of Imperial College London, who is working on one of the LHC’s experiments, researchers could have seen some evidence of supersymmetry by now. “The fact that we haven’t seen any evidence of it tells us that either our understanding of it is incomplete, or it’s a little different to what we thought – or maybe it doesn’t exist at all,” he said. Disappointed the timing of the announcement could not be worse for advocates of supersymmetry, who begin their annual international meeting at Fermilab, near Chicago, this weekend. Dr Joseph Lykken of Fermilab, who is among the conference organisers, says he and others working in the field are “disappointed” by the results – or rather, the lack of them. “There’s a certain amount of worry that’s creeping into our discussions,” he told BBC News. The worry is that the basic idea of supersymmetry might be wrong. “It’s a beautiful idea. It explains dark matter, it explains the Higgs boson, it explains some aspects of cosmology; but that doesn’t mean it’s right. “It could be that this whole framework has some fundamental flaws and we have to start over again and figure out a new direction,” he said. Experimental physicists working at the LHC, such as Professor Nash, say the results are forcing their theoretical colleagues to think again. “For the last 20 years or so, theorists have been a step ahead in that they’ve had ideas and said ‘now you need to go and look for it’. “Now we’ve done that, and they need to go scratch their heads,” he said. That is not to say that it is all over for supersymmetry. 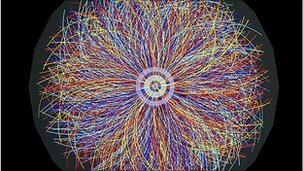 There are many other, albeit more complex, versions of the theory that have not been ruled out by the LHC results. These more complex versions suggest that super-particles might be harder to find and could take years to detect. Some old ideas that emerged around the same time as supersymmetry are being resurrected now there is a prospect that supersymmetry may be on the wane. One has the whimsical name of “Technicolor”. According to Dr Lykken, some younger theoretical physicists are beginning to develop completely novel ideas because they believe supersymmetry to be “old hat” . “Young theorists especially would love to see supersymmetry go down the drain, because it means that the real thing is something they could invent – not something that was invented by the older generation,” he said.